Two playwrights take a unique approach to adapting The World's Strongest Librarian. As a chronicle of perseverance in the face of obstacles, The World's Strongest Librarian—the 2013 memoir by Salt Lake City public librarian Josh Hanagarne—is uniquely inspirational. That doesn't mean it seemed like the most obvious candidate to turn into a play aimed at kids—one that has its world premiere through the BYU Theater Department's Young Co. But playwright Jeff Gottesfeld saw something in the book—which describes Utah native Hanagarne's lifelong struggle with Tourette's Syndrome, and the way books and weightlifting became his personal therapy for his condition—when he read a review of The World's Strongest Librarian in The New Yorker. A veteran author of books for children and young adults, as well as a one-time Salt Lake City resident, Gottesfeld was sure he wouldn't be able to get the rights to the book. "It was too good," Gottesfeld remembers thinking, "there was no chance I'm going to be able to do anything with it. Someone was going to option it." A year or so later, however, Gottesfeld reached out to the book's publisher, and was able to secure stage rights. He then contacted Elizabeth Wong, with whom Gottesfeld had been acquainted for several years and with whom he had collaborated previously. "When Jeff rang me up and said, 'Hey! Let's write a play together, read this book,' I bought it toute suite, dove into it on my Kindle, and read it in a day. I rang him up ASAP and said, 'Hella yeah, let's turn this into a play!'" Then came the hard part: finding a narrative in Hanagarne's story that would make an appealing kids' play, as commissioned by Dramatic Publishing Co. Their answer was to move away from Hanagarne's true story entirely, and craft a narrative inspired by his struggles—including a young boy with Tourette's Syndrome as a main character—that also revolved around the importance of the local library in the lives of a group of kids, and their activism when it is threatened with closure. "We took the words 'creative license' and carved up the book like we were skiing on it," Wong says. "We told Josh's story by focusing on his effect on the young people who came into daily contact with him. 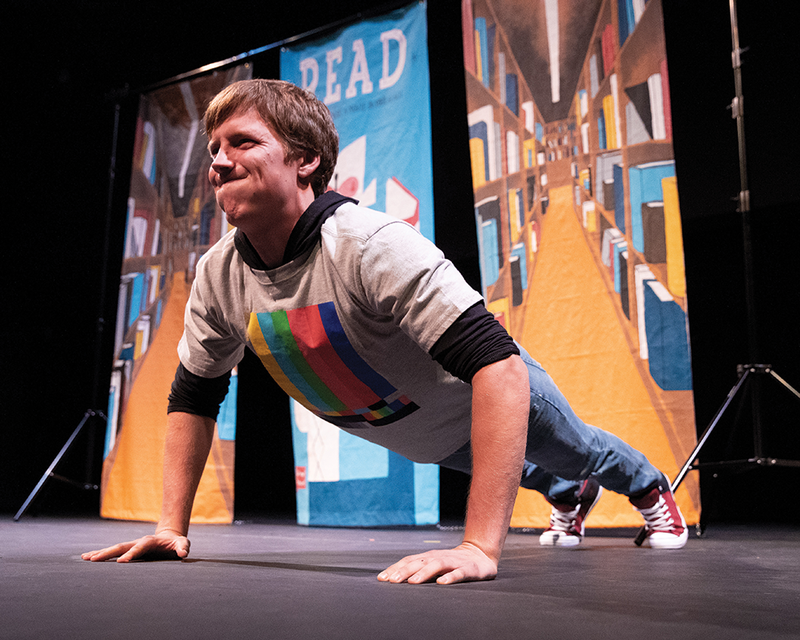 [The kids in the play] use their minds by figuring out a way to bring attention to the closing of their library, then they put their bodies on the line in support of their cause—mind and body working together. Which is the opposite of Tourette's, when mind and body are sometimes at odds." Both playwrights say their adaptation was a chance to celebrate the importance of libraries, and, in Wong's words, "sound the alarm about the quiet extinction of libraries. ... For me, the library was a place of refuge from bullies; it was a place of happy accidents and impulsive discoveries ... and a window into worlds different from Chinatown, where I grew up." "I'm drenched in the world of children, children's reading and children's librarians—who are heroes, working their asses off," Gottesfeld adds. "It's getting harder for librarians, and for libraries, to justify their existence, [but] in many ways, they are the great equalizers of society." Ultimately, despite creating a narrative all their own inspired by Hanagarne's story, both writers were determined to remain faithful to the essence of their source material. "It was important to us to preserve the tenacious spirit of [the book]," Wong says, "and to honor the humor in the book. Also, we felt it was crucial to manifest Josh's Tourette's as he did in his book, making it a character in the play, too." Gottesfeld and Wong took their completed play to the 2017 national conference of the American Alliance for Theatre & Education, where The World's Strongest Librarian won a Distinguished Play award. It was at that conference that Julia Ashworth—artistic director for BYU's Young Co., which trains educators both in creating theater for young audiences and instructing those audiences about theater—found out about the play. "[Julia] said, 'Wait a minute, that's the guy [Josh Hanagarne] from where I'm from,'" says Megan Sanborn Jones, artistic director for BYU Theater. "It just seemed like a really good fit." "What's really fascinating is, we spend a lot of time as educators and parents saying, 'Read books, improve your mind,'" Jones adds. "But we're also telling them to get outside and be active. This story, with its setting and the emphasis on physical fitness, combines both of those things." The Young Co. production will tour several Utah schools after its three-week theatrical run, and make other stops including at the Salt Lake City Main Library. It's a surprising journey for a story that started at that same library, thanks to two playwrights who were able to do some of their own creative heavy lifting.